We’d love your help. Let us know what’s wrong with this preview of Never Fear by Richard Devin. 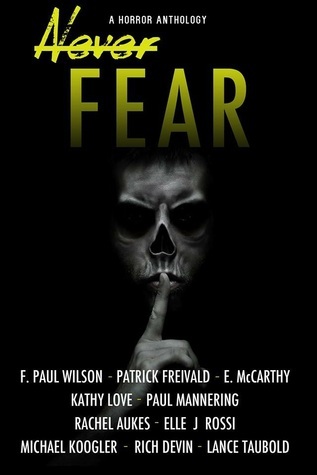 F. Paul Wilson, New York Times Bestselling Author. Rachel Aukes, Amazon Bestselling Author. E. McCarthy, New York Times Bestselling Author. Patrick Freivald, Bram Stoker Award-Nominated Author. Kathy Love, USA Today Bestselling Author. Elle J. Rossi, Up-and-Coming Author. To ask other readers questions about Never Fear, please sign up. This collection of short stories was FANTASTIC! I love reading a story that gives you a little shiver of fear and there were more than a few that hit the spot. I found Control + Alt + Delete by Rachel Aukes to be absolutely chilling. The thought of anyone having the power to control someone so thoroughly is frightening. Give it 100 years (maybe less) and this story could become reality, which makes the story even scarier. I fell in love (or terror) with Funeral March of a Marionette by Lance Taubo This collection of short stories was FANTASTIC! I love reading a story that gives you a little shiver of fear and there were more than a few that hit the spot. I fell in love (or terror) with Funeral March of a Marionette by Lance Taubold. A deranged child and unknown forces controlling Marionettes is such a nightmare. Who hasn't looked at one of the Nut Crackers and thought...gee that's kind of creepy. Taubold takes that sense of creepy to a whole new level. The Agent by Michael Koogler was terrifying as well, it's like Groundhog's Day in Hell. If this story doesn't give you a shiver, nothing will. Pretty entertaining, short and sweet. Each story is different, a quick read. Some pretty good, some not so much. All together ok.
"[A] beguiling combination of romance and murder. Is the Crown Prince of England really Jack the Ripper? His wife would certainly like to know....and so will you." "Skillful blend of romance and terror. Don't miss this." F. Paul Wilson, New York Times Bestselling Author and creator of Repairman Jack. "A plot with all kinds of twists and turns. A keeper!" USA Best Book award Thriller. The Third Hour is currently in development for a feature film. Devin's stories are included in the Never Fear anthology series and the Romantic Times: Vegas and Hunted West anthologies. Other works include: Ripper - A Love Story, Uncharted Worlds, Tales from the Casting Couch and Glory - A Nation Mourns. Non-Fiction titles: Actors' Resumes: The Definitive Guidebook, Do You Want To Be An Actor? and Stop Saying Yes - Negotiate! the current "go to" guide for major companies and their negotiating teams. He was a contributing columnist to Southern Nevada Equestrian Magazine and Envy Man magazine. Devin received the Foundation for the Vital Arts Award for his plays: Deceptive Peace and My Mother's Coming. A Champion Equestrian, he competes in Dressage with his Oldenburg partner Immerjoy (Emmy).